It is absolutely true that no two circumstances or business cases are the same, but the process of getting to the desired result is repeatable. Remember, it is a process, and there are methodical steps to getting to the desired results for your business process. There can be numerous motivations for wanting to optimize your process. It may be a matter of saving either time or money (or both, since any business would desire this). Alternatively, many optimization projects can center around the protection of IP (Intellectual Property) or process, for the purposes of expanding operations or “franchising” out a concept or model. Some industries are faced with strict and ever-changing compliance matters, forcing business owners to keep their business process in line with professional doctrine. Some organizations find themselves in the need of assessing or diagnosing performance issues, and these too are situations that can drive the need for optimization. The last (in this list, there certainly are many other examples…) situation that is commonly encountered, revolves around re-branding of a business – successful re-branding should not embrace the same methods and processes that were previously used – successful re-branding comes from a genuine implementation of change. Process mapping is the best method for gaining a thorough understanding of your business process. Understanding where you are first, is paramount to accomplishing your objectives. Clear, concise and easily understood documentation of your business process is not only helpful for business optimization, it can aid in training, auditing, performance monitoring and provide substantial credibility (to clients, industry professionals, etc.). This is the step that is highly customized for every business. 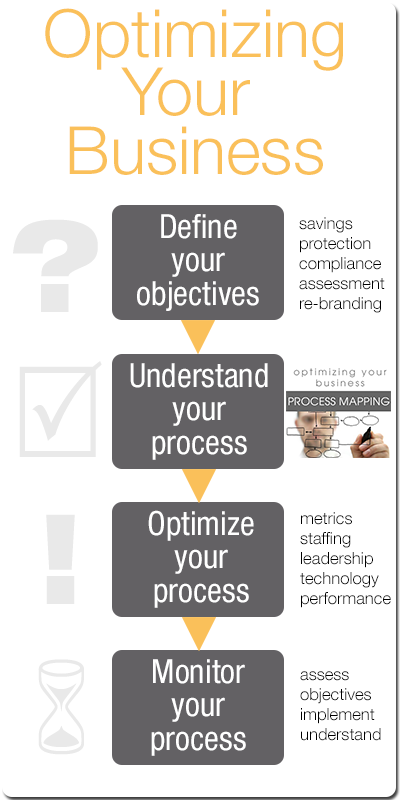 There are key factors that aid in developing the solution for your business optimization project. Metrics for any business are important to success – they are the performance numbers that matter most. Staffing is also key – having the right people doing the right job is critical. As author Jim Collins wrote in his best-selling book Good to Great, it’s first “who” then “what” – it’s all about the people you have. Of course leadership is key, from the top on down. There are many key segments in a business that can rise or fall based on leadership. Do you have leaders in your organization? Technology can also provide many opportunities for optimization – do you have all the right tools and do you know what is currently available? Previously we mentioned it’s all about the people – but are the people performing? This is simply a snapshot of some circumstances and business process pieces that can influence the optimization process. Once you know what you are looking for, where you are with your business process, and have the optimization plan ready, it’s time to implement. One common flaw we encounter occurs after a good plan is implemented – no plan for ongoing assessment is put in place. Remembering your original objectives is key during implementation. Now that you understand your business process, never depart from the mindset of improving (and never embrace the mindset of assuming – assuming all is well, assuming all is being executed according to plan…).